Preview the content of Exchange Mailboxes i.e. Emails, Contact, Tasks, Calendars etc. Facilitates Selective Conversion of EDB files to PST files. Allows Complete Migration of Exchange Mailboxes to Outlook PST. Provide Support to convert Corrupt, Encrypted or Password Protected EDB files to Unicode PST. With the help of edb files to pst tool, you can easily migrate your Exchange Mailbox items such as contacts, calendars, tasks, journal, notes to outlook pst without any loss of data. It keeps the data in intact form during the conversion of edb emails to pst. The resultant pst can easily import to Outlook pst to access the data again. The Software allows the user to quick preview the content of edb mailboxes before the conversion of edb files to pst files. It simply lists the data of exchange mailbox data in tree like structure. Click on folder or files which you to view. It also provides the flexibility to view the attachments as well with the calendars entries, tasks, journal etc. Using the software you can easily convert the corrupt or password protected Exchange mailbox data to pst. It securely extracts data from the priv.edb file with complete items such as emails, contact, calendars, tasks, journals etc. The software itself created the single pst file for each exchange mailboxes. The software provides you the advanced functionality to easily extract exchange edb to pst. It offers you the dual scan mode i.e. Quick Mode and Advanced Mode. When the edb file is in normal conditions then uses the generic mode and prefer to use the advanced mode in case edb file having mild corruption issues. Demo version of Software allows Converting and Export first 25 Items from each folder. Support: Windows 7, Windows 10 & all below versions of Windows. Can I easily convert priv.edb file using the tool? Yesyou can easily convert exchange private mailboxes(priv.edb) using the software. With the help of Software, Can I perform the bulk conversion of exchange edb mailboxes? Yes, The software is built with ease to effectively perform the conversion of exchange edb mailboxes to pst format. Does Outlook installations be necessary to perform the conversion process? Yes, The Outlook installation is necessary and should be configured with dummy account to perform the conversion process. How many EDB Mailboxes can I export using the trial version of the software? The trail version of the software allows you convert only 25 items per folder to Unicode file format. Are there any requirements of Internet connection to convert edb files to pst files? No, There is no requirement of Internet connection. The software can use in offline mode also. I extremely happy to use one of the best tools to convert edb files to pst files. I have never used such kind tool ever in my 25 years long IT career. This tool really helps me the lot to convert my oversized exchange mailbox to outlook pst without losing any information. The best part of this software is that it maintains the internal structure of EDB files during the conversion and facilitates you to use the Ignore system folder option, to restrict the creation of the unnecessary folder in the resultant file also. Thanks a lot for such a professionally built tool. Salute to your innovation bound approach. I have a huge collection of Exchange edb files and I want to archive the Exchange Mailboxes to Outlook PST But did not find any simple and easy tool to process it quickly. I have tried almost all the tools but did not get any good result. 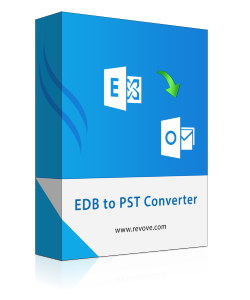 Luckily by the God’s grace, I found some information about the EDB File to Outlook PST Converter tool by Revove on the internet. I download free demo version of the software and test my exchange edb files with the tool. The demo version allows only 25 items per folder. But after using this software preview, my viewpoint has changed and I purchased this software in fair price. Since then, I have successfully archived my 50GB of exchange mailbox data to Outlook pst. The support team invincibly helps me a lot to achieve this goal. Thanks a lot.